When hanging out with the baby in the days and weeks before the flight, quite often, have them on your lap facing away from you, just like you would on a flight during takeoff and landing. Play games with them where you whisper in their ear and move their arms, and so on. If you get them used to it, they will not freak out when you have them in this position for long periods of time, and will even eat and sleep in that position. Try to schedule flight times when the baby would be sleeping, or at least when they are going to be happy sitting on your lap staring forward. Have a pad for the baby (see image below). 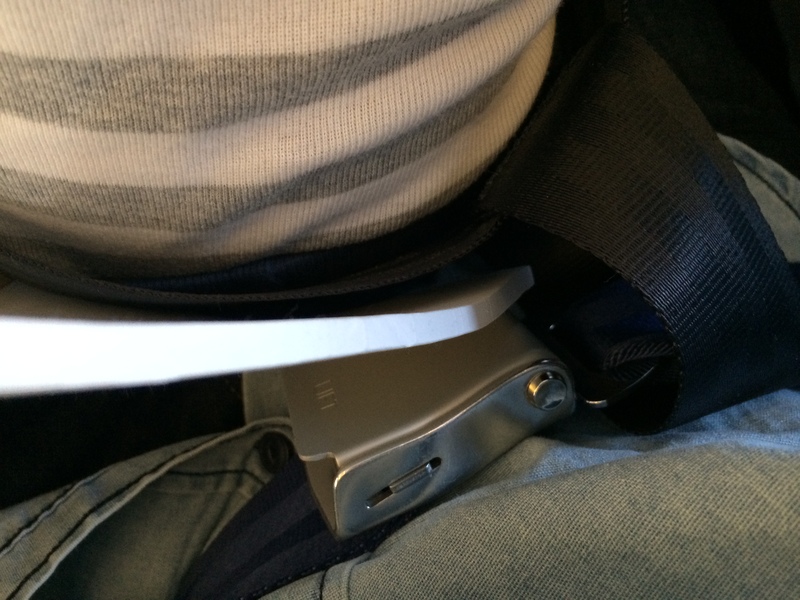 There are obviously a lot of reasons why babies freak out during takeoff and landing, but one reason must be because the buckle of the seatbelt that the parent is wearing is digging directly into the back of the baby when they are buckled in (except for Lufthansa, whose buckles are off-center). So, we have figured out if we have a small, lightweight pad between the buckle and the little guy, he is not squirming as much. If the baby uses a pacifier, make sure they have it in during takeoff and landing, to help with the pressure changes. Get an aisle seat – you will likely have to get up to change a diaper, so just make it easy on everyone and get an aisle seat. Think 2 steps ahead. Is the baby going to be hungry when you are about to takeoff? Have a bottle ready. Will you need to feed the baby during the flight? Have a plan for how you will do it. What about toys? Books? Who will change the diapers? If the baby wakes up during the night, who will go with him/her? Who will deal directly with comforting the baby if they have a freakout? On whose lap will the baby sit during takeoff and landing? Above all else, relax and don’t let yourself get stressed during the flight. Babies can sense when you are nervous and uncomfortable, so make sure you are not over worried and over concerned about it all. Just stay focused on the needs of your little one, and don’t treat them differently than you would if you were for example sitting on your sofa (if your sofa was 30 000 ft above sea level and was really uncomfortable ;). In other words, do not crowd them or try to distract them more than you normally would – it will only freak them out. If they cry, console them, but don’t get all nervous thinking “oh no, the other fliers will hate us!” – who cares what they think, especially if you are doing your best. I hope that list helps for anyone who might be needing some tips before flying with a baby. We are obviously not masters of it yet, but we are getting more and more comfortable each flight, and these are some of the things that work for me and my wife (and the little guy).